Having a blue Christmas? Fear not! Fire up these three videos for some beautifully campy hijinks that will put a smile on your face not matter how low the mercury drips. 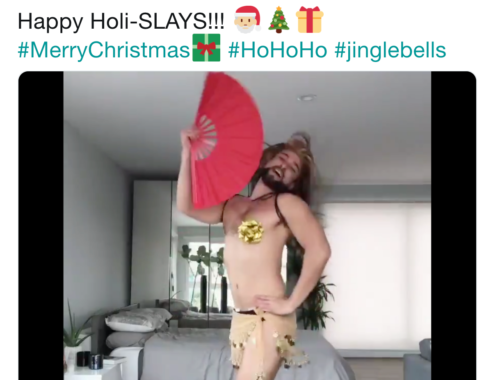 Now he’s back in a special holiday-slay performance, reprising the look and feel of his pride scenes, but this time out it’s Barbara Streisand on the playlist and a little something to make your yuletide gay! Terri Brown may not be LGBTQ, but her performance to the Mariah Carey holiday classic, “All I want for Christmas,” complete with twerking moves and Christmas tree sunglasses will show you that she is, nonetheless, a queen. Brown, 28-years-old is a food server by profession, but also performer with her dance company, We Are Tajeva. With a focus on Western African dance, her company performs and provides dance instruction. Finally, who can forget Charles Phoenix? A master or mid-century life with his retro slide shows and tours through California — as well as the owner of some of the most unforgettable suits you’ll ever come across, Phoenix is also no stranger to the holidays or delightful videos. He even started a craze a number of years ago, giving birth to the holiday pie and cake trio he christened the “cherpumple” via his “Charles Phoenix’s Test Kitchen” series. Now, it’s a little singing in his own rich baritone, accompanied with a polka dotted suit, striped wallpaper, and a vintage color wheel to really get your holidays aglow in retro kitsch. You won’t want to miss it!